I showed up in Argentina without much to do. Most of my “business” work runs automatically, and while I am working on a book, I find it unproductive to do that for more than 3 hours a day. This left me in an odd place, and one that I didn’t entirely prepare for when I went down the “Lifestyle Entrepreneur” path. When you succeed and you don’t need to work regular hours to earn a comfortable income, what do you do with yourself? I didn’t want to progressively increase my passive income, since you quickly find that incremental changes aren’t all that satisfying, and I know it’d be more exciting to work on something bigger. So… what could I work on? I know I want to build something, or multiple things, but what? The problem with this is that those skills don’t give me many opportunities to build. I can write, which I love doing, but after 3 hours or so my brain turns to jelly. That leaves 3-7 usable hours in the day for creating things, and nothing to apply them towards. And these days, if you want to build anything really new and exciting, learning some form of programming is the name of the game. Programming has always interested me (my goofing around with it was part of the inspiration for programming for marketers) but I’ve never been particularly good at it. I can hack things together, but I wouldn’t say I’m a “developer,” or trust myself on anything too serious. I enjoy doing it when I do, but I’ve never had a big project to focus on learning it through. Then, VR started to come on to the scene. I’ll admit that I was initially excited in VR because of my love for video games. I’ve spent embarrassing numbers of hours in World of Warcraft, Team Fortress 2, DOTA 2, Starcraft 2 (something about games with 2 in them?). I even drew up a rough idea for a video game when in I was in elementary school before someone told me “video games take a big team to make” and made me all sad. If only I’d known about indie development! But more recently, I’ve started to see the massive potential of the VR and AR hardware that is coming on to the market. A potential far beyond just gaming. Multiple companies and individuals are working on building the VR Internet, or “Metaverse,” a true alternative reality that we can step into by putting on headsets. And the exciting thing about that? We have no idea what it’s going to look like yet. It’s a completely new playing field. In 5-10 years we’ll look back on the first iterations of the Metaverse and laugh like we laugh now when we think back on using Dial-Up. This newness creates an exciting “wild west” environment where no one is an expert in VR yet, and everyone is making it up as they go. It’s like when the first iPhone came out. Early Objective-C developers were just figuring it out as they went, trying to create new paradigms for a mobile device while seeing what worked and what didn’t from web and desktop apps. That same environment exists right now for VR, and we have the opportunity to get in early and play a role in its development. Awesome! But, how do you do that? Over the last few months, I saw Pieter Levels posting about how he was learning 3D modeling. It looked like fun, and when he wrote up how he was transitioning it to learning VR, things started to click. From what I could see, he went from knowing nothing about 3D or VR to building a VR scene in a few months. That was pretty cool, and it looked like he didn’t struggle too much with it either. So I downloaded Unity (the most popular tool for building for VR), and started playing around. The first thing I was struck by was just how easy it is to start putting 3D scenes together like you see in popular games. You don’t have the high-res textures, but many of the underlying mechanics are built for you or fairly simple to figure out with a bit of Googling. And here was a game I built by following a tutorial 4 days after starting. I’ll have a “how I learned” post later, but for now, you can follow what I’m learning here. 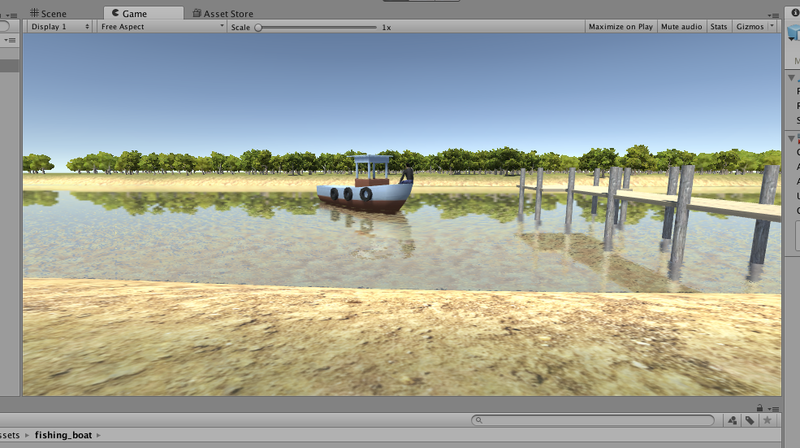 There are a few cool things that make Unity really easy to get started with. First off, everything is in one place, and it’s all in one language (C#) so you don’t have a million languages and files and confusing organization going on like you do with web programming. Second, the YouTube tutorials and help pages are fantastic. Any time I hit a problem I was able to find a solution, or hack one together from other people’s responses. The community is amazing and really helpful. Third, the joy of stepping into the thing you’re creating and moving around in it is intoxicating. I imagine this is especially true if you’ve played a lot of video games, but I think the feeling of quickly controlling this little world you’ve created would hook anyone who enjoyed LEGOs, The Sims, or just creating things in general. It’s way more rewarding than other kinds of programming since you can see and touch what you’re doing. And not only is it fun and approachable to get started, we’re at an extremely exciting point in this technology. We started getting smartphones 10 years ago or so, and innovation in that area went insane. If you were in early on iOS programming, there was a blank canvas to play around with and tons of things that needed to be figured out. But, naturally, that level of advancement slowed down, and it’s gotten more and more incremental in the last couple years. Now we’re on the edge of the next major paradigm shift in our computing hardware, and a huge part of that is going to be VR and AR. Think of it like this. If you could go back and be among the first people working on iPhone apps, would you want to do that? Or what about be one of the first people building websites? That’s the kind of opportunity that VR and AR are providing. We are going to have some sort of digital Metaverse, like the ones in Snow Crash and Ready Player One within the next few years, and anyone can pick up the skills to be a part of creating it right now. I’m insanely excited about it. And the more people working on it, the better it will be and the faster it can advance, so I hope you are too. This is presumptive of me since I’ve only been working on it for a few weeks, but if you’re all fired up and ready to go, here’s what worked for me for starting out. I wouldn’t invest in a serious VR rig until you’re sure you’re going to stick with it. Download Unity, and start following the Jimmy Vegas tutorials. Once you get through the first 20 videos of the Unity Beginner series, you’ll be on your way to start screwing around with your own projects. That was what got me to the video I showed you earlier, and then let me start working on my own ideas. Or, you could start with WebVR, something I’m starting to focus more on now since I think this will bring VR to the masses first. This isn’t as clear cut to jump in on, but you can check out the A-Frame tutorials. And if you want more ideas, check out my progress page. I’m using it as a form of accountability to make sure I learn at least a little something every day, and it might help you find new ideas. Have fun! And let me know if you dive in as well.